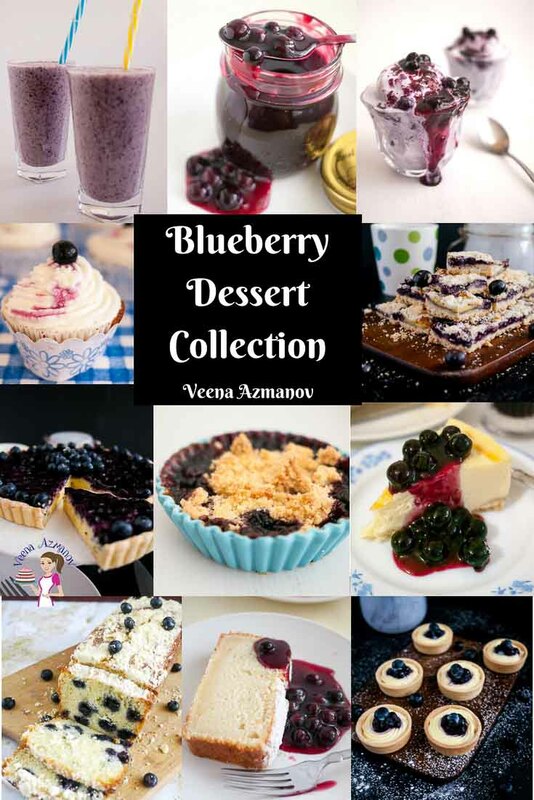 If you were wondering how to make a blueberry cheesecake then this is the best blueberry cheesecake recipe. 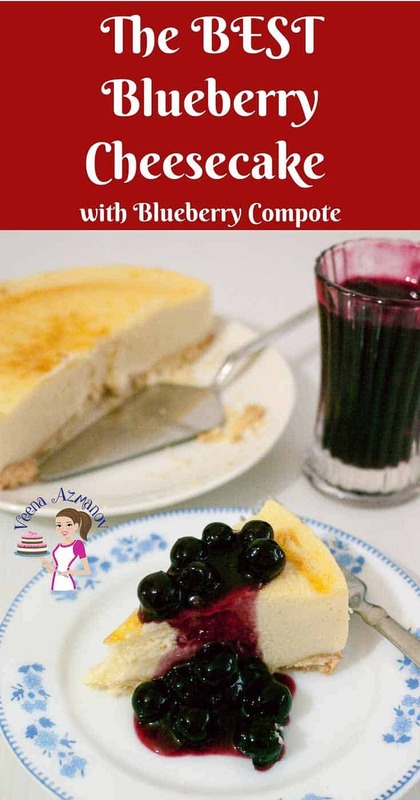 This simple, easy and effortless recipe has creamy mascarpone cheesecake batter baked to perfection then topped with plump juicy blueberry compote that just melts in the mouth. Make it with fresh or frozen blueberries any time of the year. One of my absolute favorite desserts is cheesecake. I can make and eat cheesecake at any time. 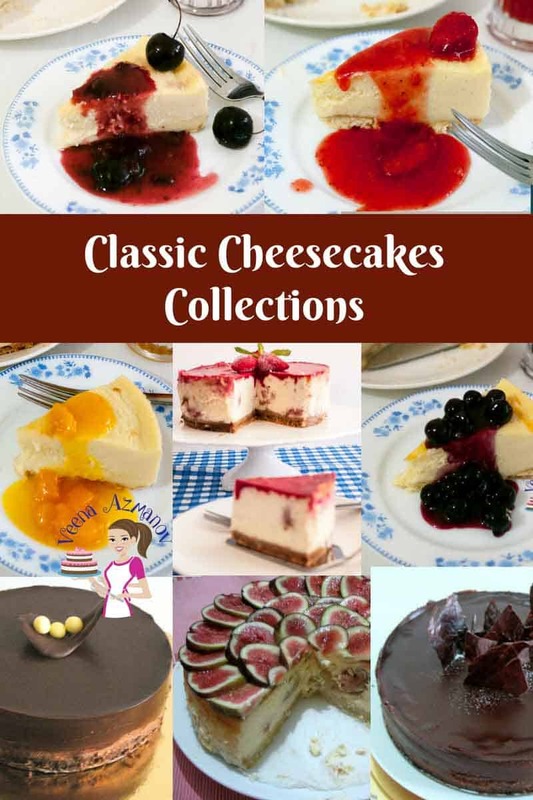 As you can see on this blog I have some really unique cheesecakes like fig cheesecake and mangoes cheesecake too! I have lost count of the number of times I have made cheesecakes. When in college I would always be in charge of desserts! Guess what I always made for my friends? Yup, cheesecake! My favorite is strawberry cheesecake and Chocolate Cheesecake. This blueberry cheesecake has always been my tease. I love blueberries but we never get fresh blueberries and if we do then they are really so expensive! Recently, we started getting frozen blueberries which opened whole new possibilities for me. Blueberries -Use fresh blueberries when they are in season. 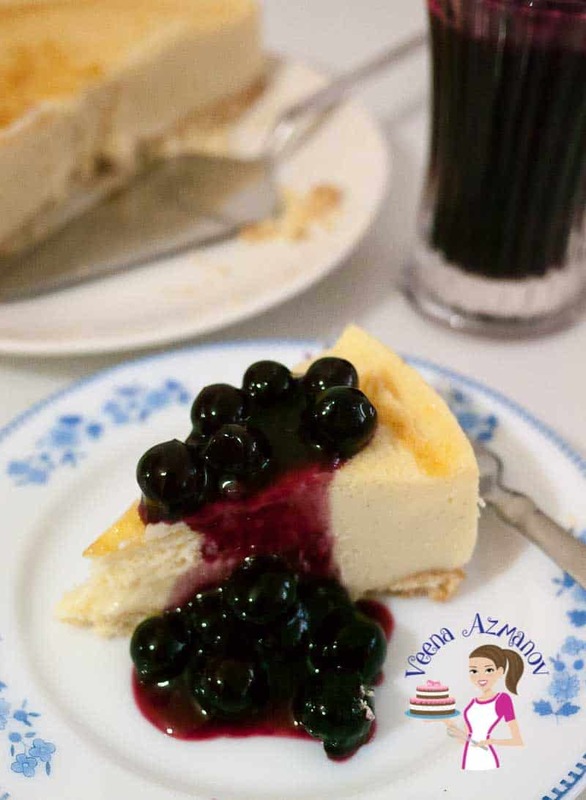 Frozen blueberries work perfectly well with this cheesecake. No need to thaw the blueberries and they cook right down, soaking all the sugar and become plump. Cream Cheese – I’m a huge fan of Mascarpone or Philadelphia cheese. I usually rely on one of these. But that does not mean you can’t use any other. Any local brand with a high-fat content of 38 to 40 % is great. You can use lower fat cream cheese too but you will be compromising on texture and richness. Be aware low-fat cream cheese will be soft with slices that may not hold up when moved. 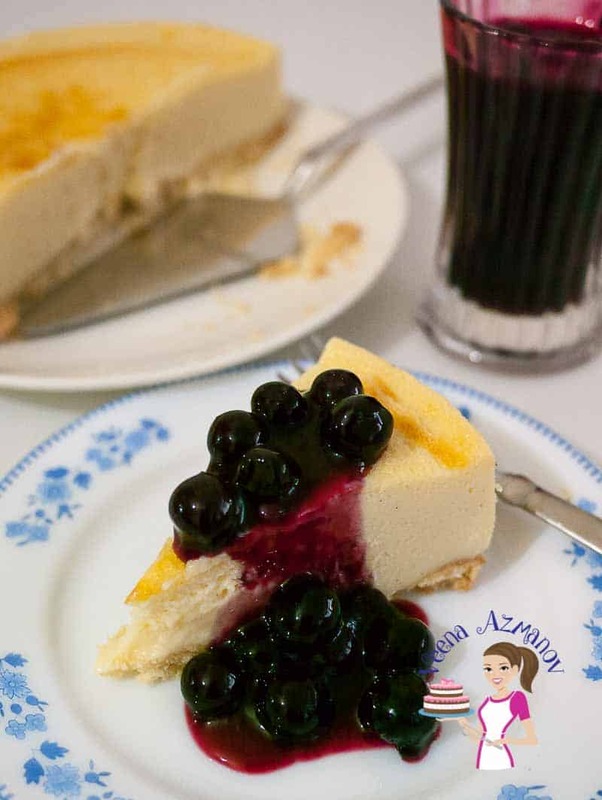 Sugar – A good cheesecake is not necessarily too sweet. This sugar has just the right balance and goes well with the sweet blueberry compote. Sour Cream– The tartness in the sour cream helps balance rich cream cheese and help lighten the batter some. Cornstarch – helps keep the custard batter together which means you get some pretty slices. Lemon juice – help cut the sweetness and brings out the flavor in the cheesecake really well. It does not affect the taste so don’t worry it won’t make the cheesecake lemony. Have you ever had a situation where you didn’t have digestive biscuits, graham crackers or Oreos to make a cheesecake base? Well, that’s happened to me more than once. 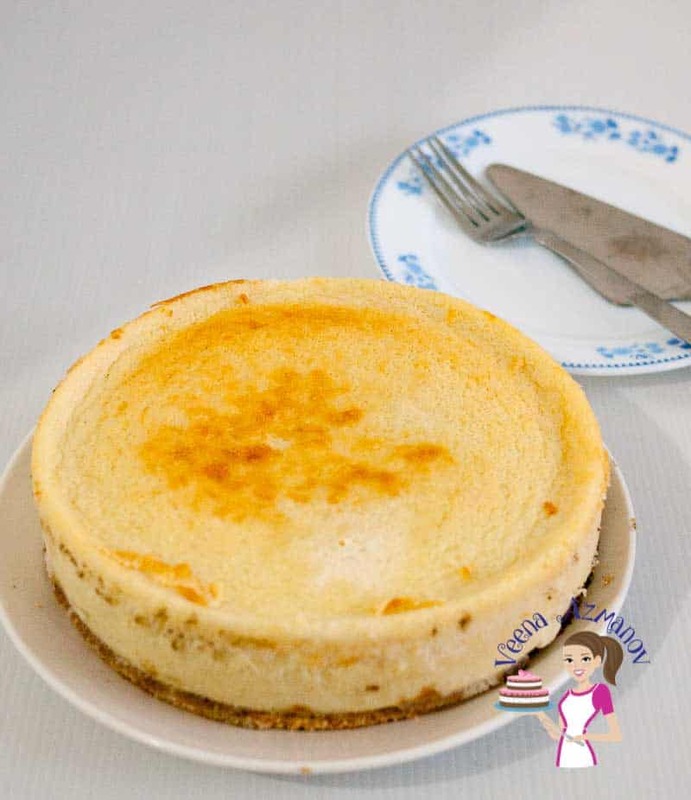 So, here’s a quick and easy homemade cheesecake crust that you will love making from scratch. Crush the biscuits in a zip lock bag with a rolling pin or pulse in a food processor. Chill in the fridge for at least15 minutes while you prepare the cheesecake batter. Followed by the sugar – use a whisk to combine until smooth with no lumps. Next, add the cornstarch, vanilla, and lemon juice. Add eggs one at a time making sure each is well incorporated. Place the springform pan on a baking tray and pour one cup of hot water in the baking tray outside the springform pan. Heat the blueberries with its juices, water, cornstarch, and sugar over low heat until the sugar has melted and the cornstarch has thickened the mixture. Taste and adjust sweetness. If necessary add a little sugar and dissolve again. Let cool to room temperature or slightly war. 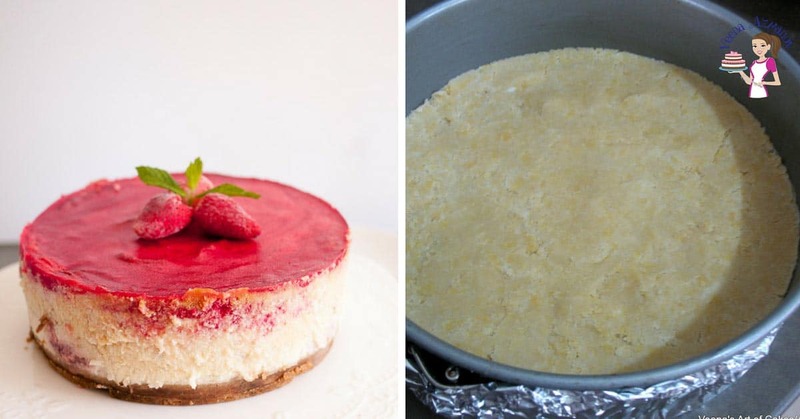 Cool cheesecake in the fridge for a few hours or overnight before you serve it. 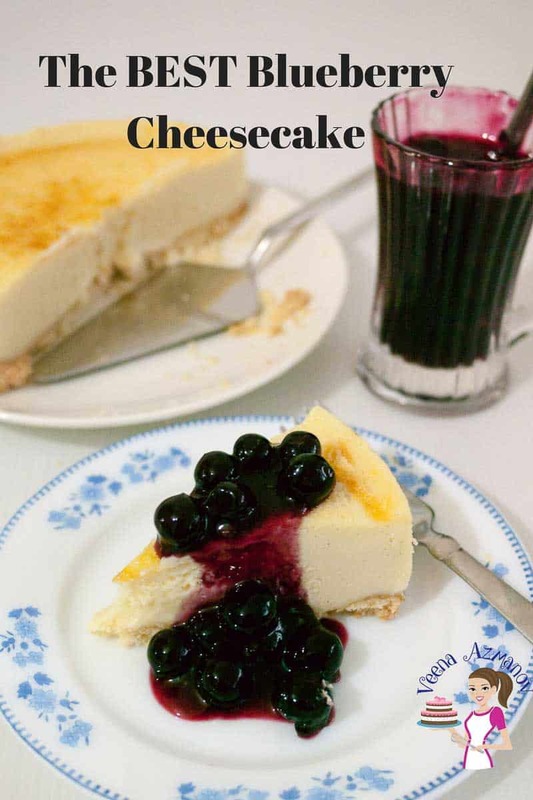 Alternatively, you may choose to omit the gelatin and serve the blueberry sauce on the side with the cheesecake. 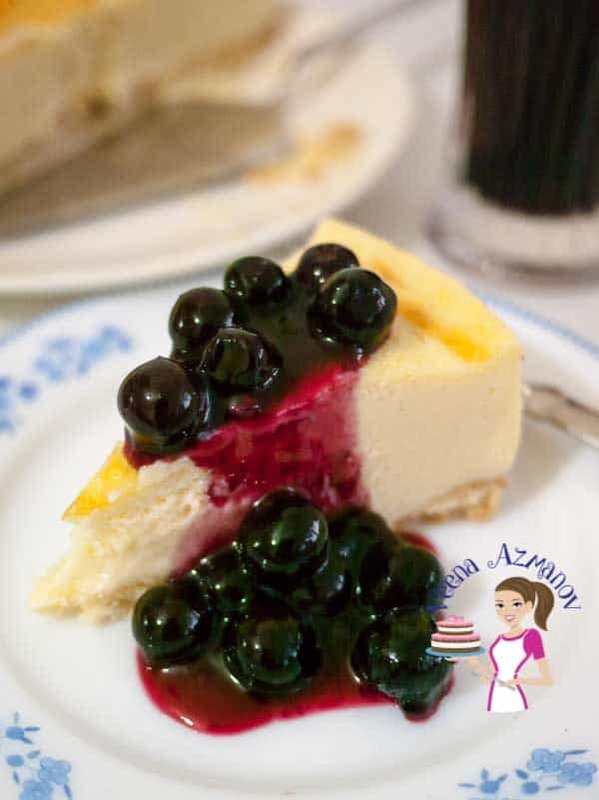 The BEST Blueberry Cheesecake | Classic Blueberry Cheesecake | Easy Blueberry Cheesecake. Followed by the sugar - use a whisk to combine until smooth with no lumps. Place the springform pan on a baking tray and pour one cup hot water in the baking tray outside the springform pan. It looks stunning! So creamy and delicious, definitely trying this! So glad to hear that Agness. I have made before a cheesecake with mascarpone cheese and is simply divine!! I loved your recipe!! Looks amazing! Thank you so much Ludmilla. A blueberry cheesecake really is a classic dessert. I have never made a cheesecake before, but I am going to have to give it a try. Oh you will love cheesecakes Dannii..! My all time favorite desserts!! Love this classic! 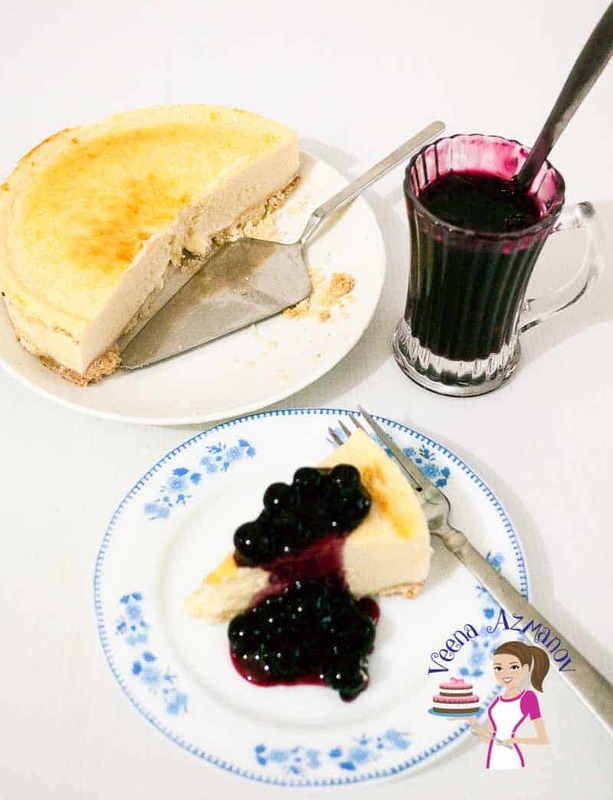 I always made baked cheesecake with blueberry pie filling on top! Thank you so much Jemma!! thank you for your reply it is interesting you do your own crust but can you post about it? it seems better than digestive. 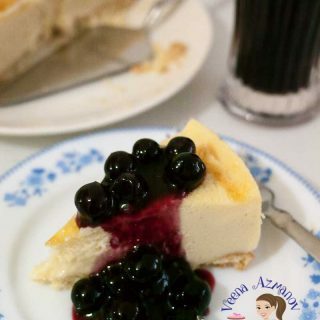 HI I ADORE CHEESECAKES YOUR RECIPE LOOKS DELICIOUS THANKS FOR SHARING BUT I HAVE QUESTION SINCE MASCARPONE CHEESE IS EXPENSIVE CAN I JUST REPLACE IT WITH CREAM CHEESE OF SAME AMOUNT AGAIN THANKS FOR SHARING! Oh yes,, You can also use any other cream cheese with similar fat percentage would be good..